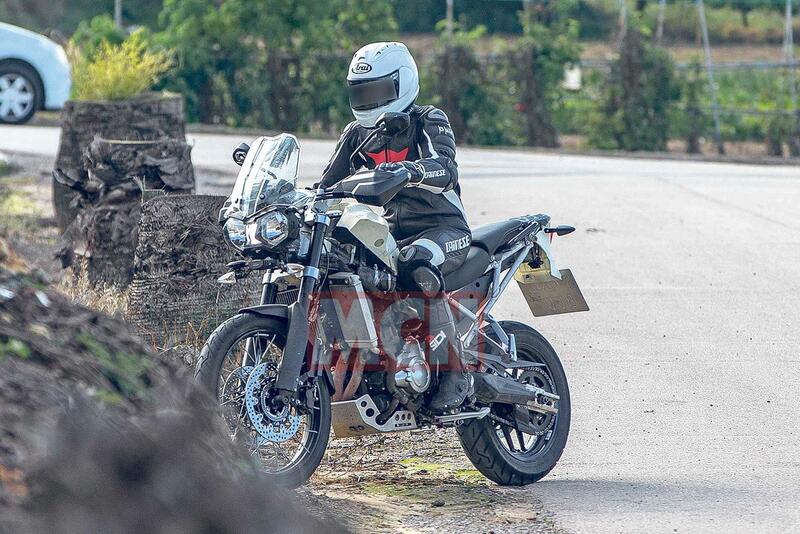 These new spyshots reveal that Triumph are testing an adventure-friendly update to the Tiger 800, which could be officially revealed as early as next year. The test mule has a revised engine with a shallower sump, new cases and larger-diameter header pipes, all of which will help the bike get through upcoming Euro5 regulations. But the bike is also likely to be boosted to 900cc. An earlier test mule had a 19in cast front wheel, however this Triumph Tiger model has a 21in spoked front wheel, so it’s clearly the more off-road, XC variant. It also has longer travel suspension and what appears to be a new rear suspension linkage; a possible solution to the age-old suspension travel vs. low seat height conundrum. Together with the shallow sump, this new XC has plenty of ground clearance, which should make it a real off-road contender. From the pictures it’s also clear that Triumph has addressed another of the current 800’s flaws. The rear subframe and pillion pegs on the current model are welded on, so an off-road tumble could easily require a replacement frame or result in a total writeoff. However on this new bike, Triumph have used a bolt-on subframe with removeable pillion pegs (as seen on the latest 1200). We expect this new Tiger to go on sale in early 2020. Power up: A new engine could deliver up to 110bhp, which puts it in contention with rivals from Ducati, KTM and BMW. Off the beaten path: New suspension and smaller sump give the bike loads of clearance and huge off-road potential. Swap it: A twisted subframe causing a write-off is a thing of the past as it’s now unboltable so can be easily swapped. What a pair: We saw 19in cast wheels in the last pics, suggesting Triumph are sticking with the road ‘XR’ and off-road 'XC' models.